Grant Ruediger held New Haven hitless through four innings and finished the evening with 11 strikeouts. Hermann, Mo. 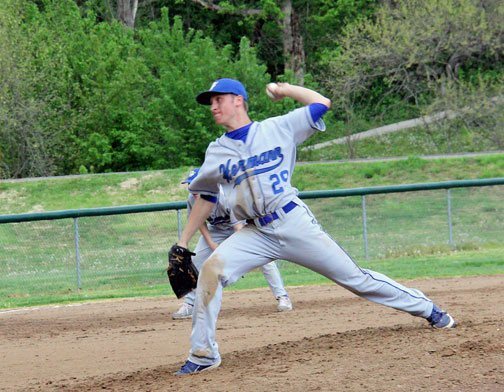 - With one swing of the bat and Hermann’s Grant Ruediger in complete control from the mound, Hermann cruised to a 6-1 victory, handing New Haven their 10th loss on the year. New Haven’s Garrett Schoenfeld got off to a good start, retiring Hermann’s first two batters. But after giving up a two out walk, Craig Winkelmann knocked a single to center field, scoring Grant Ruediger after stealing second base earlier in the count, giving Hermann a 1-0 lead. New Have was unable to capitalize off a two out walk to Schoenfeld in their half of the first inning and the Grant Ruediger’s only walk on the night. In the top of the second with bases loaded and two outs, Ben Held smashed a grand slam off a first pitch hanging curve ball, giving Hermann a 5-0 lead. Grant Ruediger held New Haven hitless through four innings when Blake Eggars led off the fifth with a double to right field, but was left stranded after Tyler Strobel and Brande Carey both struck out looking and Cameron Prittchett ended the inning flying out to center field. 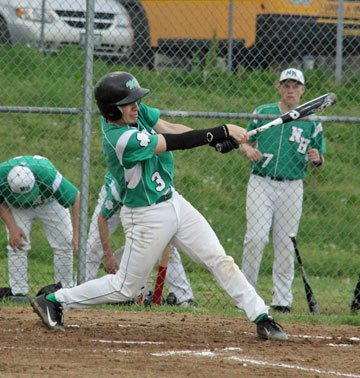 In the sixth, New Haven’s Austin Madden (pictured right) had a one out single. Schoenfeld followed up with a double to right field, giving New Haven two runners in scoring position with just one out. Grant Ruediger held his composer like he had all game, forcing Drew Schwentker to groundout to second, scoring New Haven’s only run before Kyle Ruediger ended the inning by flying out to right field. Grant Ruediger ended the seventh, setting down New Haven in order, picking up his third win on the year. Saturday New Haven will begin the postseason at New Bloomfield in the Class 2 District 8 tournament, after being bumped from Class 1 to Class 2. 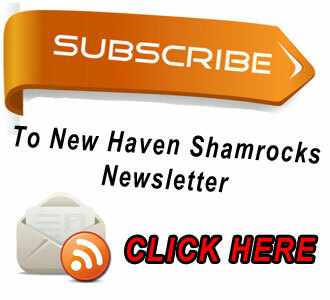 The Shamrocks will play their first round game on Saturday at 1 p.m. against the number 4 seed, New Bloomfield. If New Haven wins on Saturday they will then play on Tuesday May 14 at 7 p.m. against the number (1) Russelville.